Fitness straps expand the range of hands and arms when practicing yoga. This makes it possible to stay longer in challenging yoga positions which otherwise would probably not even be possible at all. 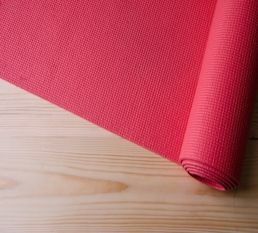 The resulat is a more effective yoga training. Elastic yoga resistance bands or rubber chest expanders are made of vulcanized latex. The latex is moulded and stretched before being placed in drying ovens. Later they are cut into the prefered shape, silk printed and checked to meet the required quality standard. 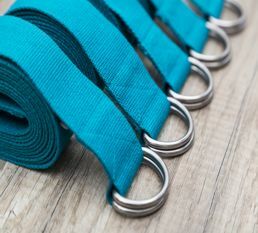 yoga resistance band manufacturer sample yoga stretch band manufacturer sample yoga resistance band manufacturer samples yoga resistance band material assorted yoga strap colors purple yoga strap manufacturer sample fitness factory product photo example text yoga strap with multiple loops - sample of a G.F.F. yoga equipment factory Inside a G.F.F. 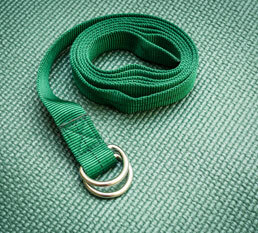 yoga strap production.